An annuity is a type of mortgage for which periodically remain the same over the full life of the loan. It has the characteristic of having higher interest payments in the beginning which lower over time. In contrast the capital downpayments are initially lower, but increase as time passes by. As a second step the monthly payments can be calculated by dividing the total debt at the start of the mortgage B, by the annuity factor F.
The interest I that has to be paid over a monthly period is simply the outstanding debt at the beginning of the month multiplied by the annual interest rate r divided by the periodical payments pp, over a year e.g. 12. The capital downpayment equals the monthly payment C minus the interest I due over the month. One advantage of the annuity mortgage is that it allows people paying back debt at the same fixed payment every months. This makes it easier for creating your household budget. Additionally, the annuity mortgage has the advantage of having lower repyaments in the beginning. This frees up liquidity for households in a period when they are needed the most. 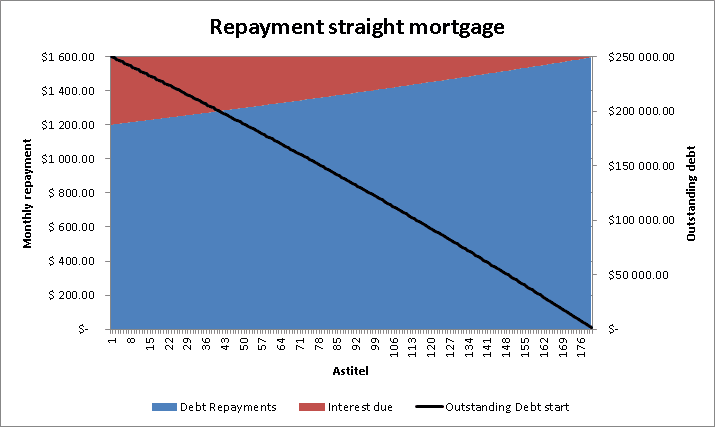 As a downside it has the outstanding debt is reduced slower compared to the straightline mortgage. As a result, financing cost a higher under an annuity mortgage. An annuity mortgage is a simple and cost efficient way to repay your mortgage debt at a fast pace. However, it has the advantage of creating more liquidity freedom in the beginning when it is needed the most. However, financing cost are also higher compared to the straightline mortgage.